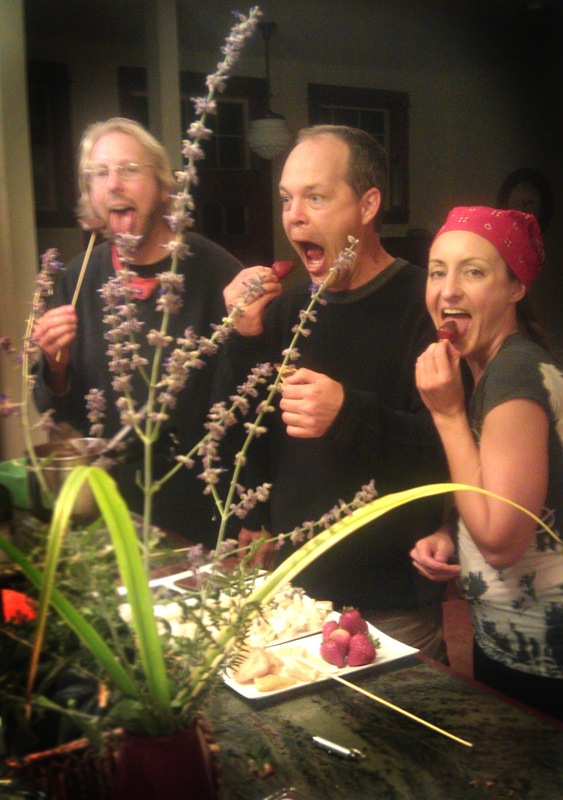 Chocolate Fondue at Luminaria Sanctuary! This weekend was a blast! Our Creation Meditation Celebration was a wonderful success! We built a raised garden bed out of recycled materials from the Leaning Tower of Luminaria, loved and protected the land through wildland fire control, watched a screening of the new Tron, ate waaay too much, played and talked and hung out and had a mini-bonfire and sleepover. HOLY COW Highlight! Chocolate extravaganza! 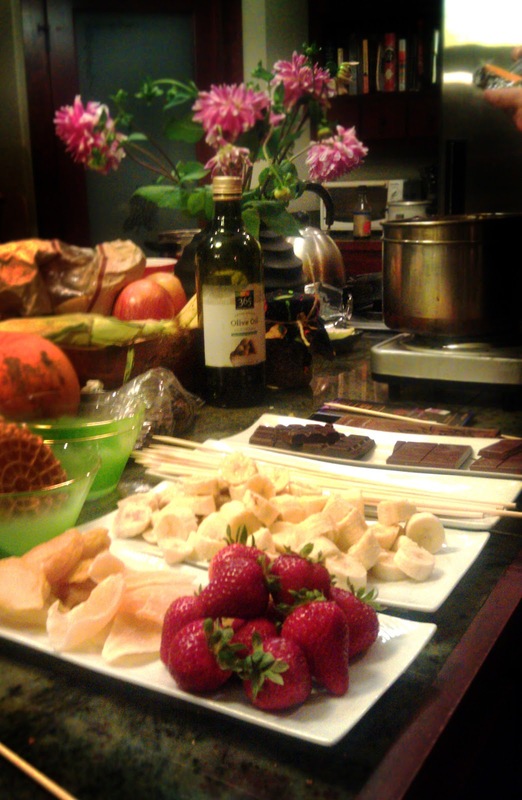 Amazing sinfully delicious Chocolate Fondue was catered for our amazing community members and volunteers by the talented and beautiful Amy Levinger of Mind Body Fuel. She also rocked our world with her own special version of death-defying macaroni and cheese, and more on Saturday night. After a day of working in the sun, it was perfect. Total indulgence heaven! Chocolate fondue is sooo easy to make, and sooo much fun! It can be made gluten-free and vegan if you get the right kind of chocolate chips, and substitute coconut or other vegan milk for the cream in the recipe. This is the perfect food to play with! Get creative and experiment with different bits to dip in the chocolate: try drizzling it over pastries; over ice-cream popsicles and freezing them; or just dunk your favorite fruits! Basically, you will want to take some creamy-type substance (like cream, milk, coconut milk, etc.) and heat it. Then you will add chocolate chips and stir over low heat until milk and chips are blended, melted and smooth. You can add a little oil (like coconut oil or olive oil) to help the consistency if desired. There is no set-in-stone ratio; just give it a shot. While it is still warm, dip your favorite treats in the chocolate and NOSH IT UP! Yum! 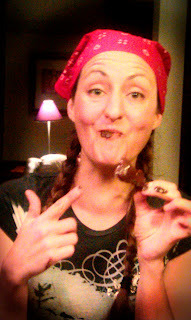 Amy used fresh strawberries, candied pears, candied ginger, vanilla cookie wafers, dried mango, and banana for dipping into the chocolate. We quickly abandoned the keep-your-paws-clean skewers she thoughtfully provided and just went head over heels into chocolate heaven! You'll need a double-boiler to melt the chocolate. If you don't have one, don't panic! They are easy to make. A double boiler allows eggs and other heat-sensitive sauce ingredients (like chocolate) to heat slowly and evenly, eliminating the possibility of scorching or overcooking. Chocolate must almost always be melted in a double boiler, because direct heat will cause the temperature to rise too quickly and the consistency to be ruined. A double boiler is a "specialized" piece of kitchen equipment consisting of two fitted saucepans. The larger bottom saucepan is partially filled with water brought to a simmer or boil. The inner/top saucepan uses this indirect steam/hot water heat to melt chocolate, cook custards and sauces, or even melt wax for candlemaking. A double boiler can also be improvised with a large saucepan and a bowl, or two saucepans separated by a trivet or other heat-resistant spacer. A metal or glass bowl inside a saucepan works well. 1 Warm the cream over moderate heat until tiny bubbles show and begins to lightly and slowly boil. Add the chocolate and whisk until smooth and full incorporated. 2 Immediately transfer to a fondue pot heated at low or with a low flame, or serve straight from the pot. 3 Arrange the dippables on a platter or plates around the chocolate pot. Use a fondue fork, bamboo skewer, seafood fork, or salad fork to dip the fruit pieces and other dippables into the hot melted cream chocolate mixture. Eat immediately.